"This unit is just fantastic I have this next to me at night because I use to get bitten while in bed since I have had this unit ,no more mozzies buzzing around me,it’s fan is super quite and the light is nice at night too....A Must in every home.....Definitely recommend!!" No More Pesky Mosquitos Or Harsh Chemical Sprays With Kleva UV Mosquito Trap, Perfect for Both Indoor and Outdoor Use! "Collapsable strainer is great for pasta and veggies,and collapses to a size of a bread and butter plate....Awesome would recommend to everyone..."
"This mat was a god send,I have a little dog and he ALWAYS brought crap in through the doggie door and it mainly after I just mopped,WELL not ANYMORE this mat is fabulous no more wet paw prints or dirt.....MUST buy.....definitely recommend!" "I actually used one of my other knives with the sharpener,sliced beautiful,I did however find the sharpener a bit awkward trying to stick it to my bench but persistence won in the end,I would say to ppl make sure you check that it is stuck before you just go ahead and use the sharpener as a SAFETY precaution!" Love the Sumo Slicer! My mum and sister were very impressed too. "I showed my mother and sister the sumo slicer & my sister thought I was silly to buy it, believing that products never work as shown on TV, but after giving her some vegetables to try slicing and shredding with it, she loved it so much I gave her my second one! I already had the garnishing duo sets from my knives purchase a while back, so my sister and mother now have the 2 sets I got with the Sumo Slicer. The peeler is the easiest to use ever! I must admit I've not used the julienne slicer yet ... I prefer a thicker julienne than that will create. Can't wait to see what marvel KlevaRange will come out with next!" Buy 1 GET 1 FREE Kleva Sumo Slicer - Slice, Grate and Shred in Seconds PLUS 2 FREE Garnishing Duo Sets! "Very happy with the Kleva Iron. I really like using it as a steamer." "These are easy to use and finally I have a good set of knives!!" "I am extremely pleased with everything, I was a bit wary of the knives at first as they are so sharp, but I'm now used to using them and feel at ease with them. The steak knives I purchased are fabulous. I have been so pleased with everything, that I purchased another two knife sets, magnetic bamboo blocks, and sharpeners for my daughter and son for Christmas. Regards Anne Barter "
"We love out new Kleva Cut Master Series 4pc Steak Knife Set. We use them just about every night, even the kids comment on how good they are. We love them, best purchase. " "This experience was incredible - it was actually bought for my mother with my whole family chipping in and the whole process was easy, fast and efficient. On top of that, my mother (who has bursitis in both hips) says she sleeps easier now and loves it!!! I would recommend this to anyone 😁"
"Easy process, fast delivery and quality products "
"This product is great so quick to grate Vegas I just love it I make a lot of veg slices and now it’s less hassles grating by hand this machine does it all glad I bought it happy customer thankyou"
"The first sonic cleanser I received did not rotate. After contacting the company and being asked to send them a short video , I was promptly sent a replacement which is working perfectly. Very impressed and will buy from again. Thanks. " "love it love it when I put the Kleva Sumo Slicer together, instead of grateing one carrott for dinner or a salad, I grate a couple and then put it in a freezer bag, seal with Kleva seal and put in the freezer. Very happy"
"Kleva Range has asked me a couple of times to review this item. However, this was part of a package deal, as I got this nice item when I bought something else. It's pretty good actually, and with a battery in it, the arm swings back and forth. I like it and especially pleased it was gratis. " Very Lucky Fortune Cat Help Bring fortune To Your Home, Health, Love and Money? "Thank you I love my knives "
"Very happy with the way the unit works. 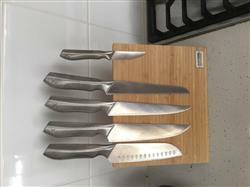 As described by seller"
"best knives I have ever bought"
"it was very easy "
"Good. Easy to use. " BUY 1 Get 1 FREE Electric Pepper & Salt Grinder - Quick and Controlled Seasoning With Built in LED Light! The instant Trolley bag that folds up to fit in your glove box! BUY 1 GET 1 FREE! "These knives are really good so far. They do cut thought tomatoes etc😂😂. I'm very happy with them"
"I absolutely love theses knives, I can’t believe the difference and the rubbish I’ve been using the past number of years. " "It was enjoyable to use!" "I am happy I made a good decision to buy such valuable products! Nice sharp, light weight and easy to use! Thanks!" "Works as described and seen on TV"
"It is a great knife set. Would highly recommend it. My Wife loves it that’s the best part. " "Awesome iron Great On curtains hanging up Does everything it says this Dose"